Although the weather has been super weird lately – super cold on some days and super warm on others, I have really been looking forward to wearing Summer clothes. In particular, playsuits, off shoulder tops, dresses and shorts! 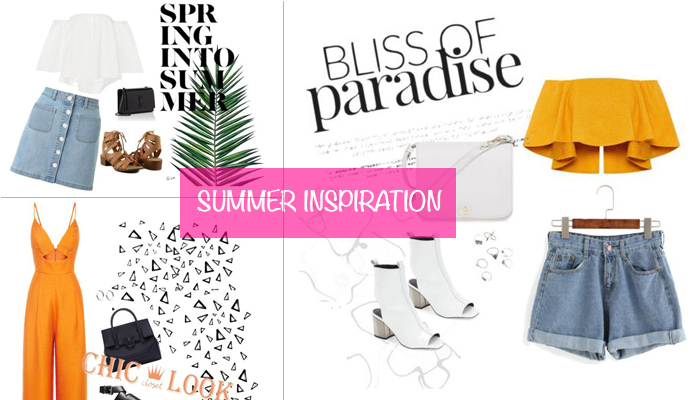 So, I thought I’d put together some outfit inspiration on what I’m looking forward to wear during the Summer! 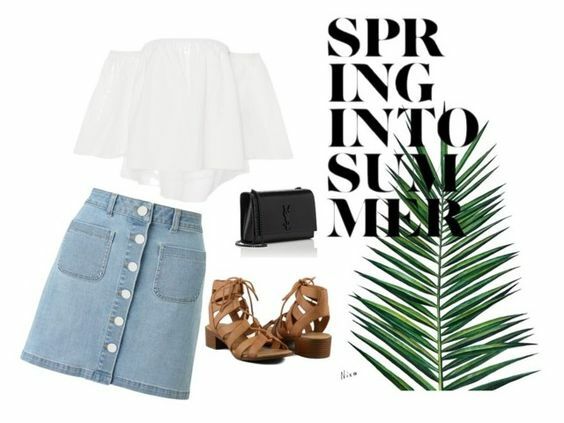 I think this outfit is super cute for the summer. An off shoulder top paired with high waisted denim shorts?! YESSS please! And how pretty are those Topshop White Peep Toe Boots?! I think wearing white shoes and a white shorts are super pretty for the summer. I’ve been really loving denim skirts lately. I think they can be worn with anything and will definitely be a summer staple. I also really love the look of tan lace up shoes and I think they will go quite well with the denim skirts and the cute white off shoulder top! Okay so I’ve been on the hunt for a jumpsuit for ages now and can’t find one that fits me well because I’m so short. That was until I came across a Khaki jumpsuit I got from Temt. The style was culotte jumpsuit and the bottom leg bit was light and sheer so very airy. It’s the perfect summer jumpsuit and I’m obsessed and have been wearing it a lot! So, when I saw this gorgeous orange/yellow jumpsuit, I just had to include it because it’s the perfect summer colour. I think this jumpsuit will go perfectly with a pair of heels and a cute black bag. Very chic yet casual! If you’d like to know where some of these are from, check out my Polyvore account!